Courtesy Notre Dame Notre Dame guard T.J. Gibbs led the Irish in scoring with 15.3 points per game last season and shot better than 40 percent from 3-point range. He also played the third-most minutes in Irish history. Nov. 1: Central St. (exhibition), 7 p.m.
Nov. 8: Chicago St., 7 p.m.
Nov. 14: Radford, 7 p.m.
Nov. 20: Duquesne, 7 p.m.
Nov. 27: Illinois, 7 p.m.
Dec. 4: vs. Oklahoma, (at New York), 7 p.m.
Dec. 8: UCLA, 10:30 p.m.
Dec. 15: Purdue (at Bankers Life Fieldhouse), 1:30 p.m.
Dec. 18: Binghampton, 7 p.m.
Dec. 20: Jacksonville, 7 p.m.
Jan. 1: at Va. Tech, 1 p.m.
Jan. 15: at North Carolina, 9 p.m.
Jan. 19: N.C. State, 2 p.m.
Jan. 22: at Georgia Tech, 7 p.m.
Jan. 26: Virginia, 1 p.m.
Jan. 28: Duke, 7 p.m.
Feb. 2: at Boston College, 2 p.m.
Feb. 6: at Miami (Fla.), 7 p.m.
Feb. 10: Georgia Tech, 6 p.m.
Feb. 16: at Virginia, 2 p.m.
Feb. 19: Wake Forest, 7 p.m.
Feb. 23: Va. Tech, 4 p.m.
Feb. 25: at Florida St., 7 p.m.
March 3: at Louisville, 1:30 p.m.
March 6: Clemson, 9 p.m.
• Notre Dame is coming off an injury-plagued campaign that ended with a second-round exit in the NIT. Preseason ACC Player of the Year Bonzie Colson broke his foot in late December and the Irish lost seven of their first nine games without him. • Colson is gone, but Notre Dame returns two starters: high-scoring guard T.J. Gibbs, and defensive standout Rex Pflueger. Also back is sophomore D.J. Harvey, a top-50 recruit from the 2017 class who missed a large part of the season with a knee injury. • Mike Brey, entering his 19th season as the head coach, brought in one of his best recruiting classes this season, the No. 15 class nationally per 24/7 Sports. Four top-100 recruits headline the class, led by 6-foot-10 forward Nate Laszewski. • The Irish traveled to the Bahamas in August for a three-game exhibition tour against teams from the island nation. Notre Dame won all three games relatively easily but was without Harvey, who had microfracture surgery on his knee in the offseason. It's unclear if he'll be ready for the start of the season. • Before missing the NCAA Tournament last season, Notre Dame had made the field in seven of the previous eight years. The Irish haven't missed the Tournament in back-to-back years since 2005-06. Dec. 8 at UCLA: The Bruins were an NCAA Tournament team in 2018 and return a ton of talent, much of it in the frontcourt. This is an early road test for a mostly inexperienced Irish team. Dec. 15 vs. Purdue: The Boilermakers and Irish are young teams that figure to rise and fall around the talent of one star guard. This Crossroads matchup in Indianapolis will provide an idea of which team has a superior supporting cast. Jan. 1 at Virginia Tech: The Irish open the ACC schedule with a road matchup against a 2018 NCAA Tournament opponent. Jan. 28 vs. Duke: The Blue Devils are a potential preseason No. 1 and visit Purcell Pavilion for a nationally televised Monday night game. This could be the best atmosphere of the season. Inexperience: This is one of Brey's least-experienced teams. 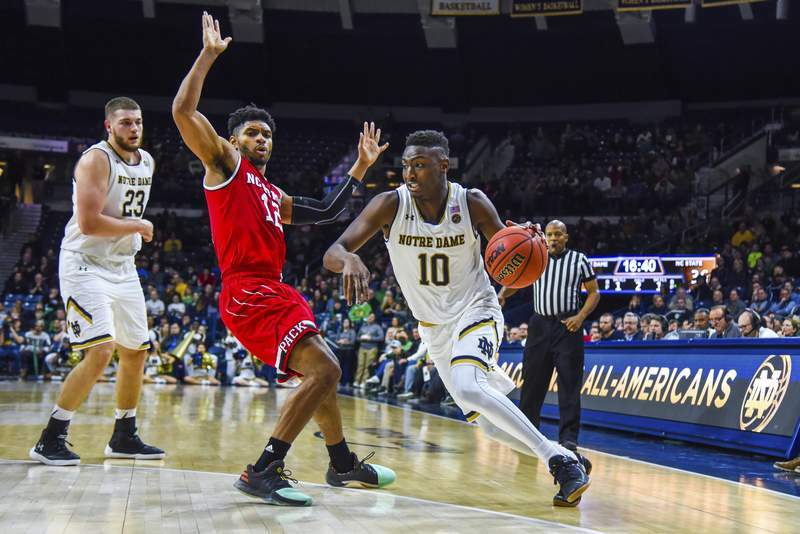 The Irish return only the two starters, and while the incoming freshman class – along with transfer big man Juwan Durham, a 6-foot-11 former top-50 recruit – is talented, it will have to gain experience on the fly to be successful. Top 25 wins: Notre Dame beat then-No. 6 Wichita State early in the season last year, then lost seven straight against ranked opponents the rest of the way. The Irish will need to win some marquee matchups to return to the NCAA Tournament. Replacing Bonzie Colson: Colson was everything for the Irish the last two seasons, averaging a double-double in both campaigns. Notre Dame gained experience without him when he was hurt, but it remains to be seen if the Irish can thrive without the energetic big man.